This easy gardening kit helps you grow your own fresh kale. In the land of leafy greens, kale reigns supreme (we hear its marketing team is top notch). Enjoy it in your own farm-to-table salads with this easy DIY kit. Get the seeds started right in the natural jute bag, and once they're ready to grow on their own, transfer the whole biodegradable bag out to the garden. 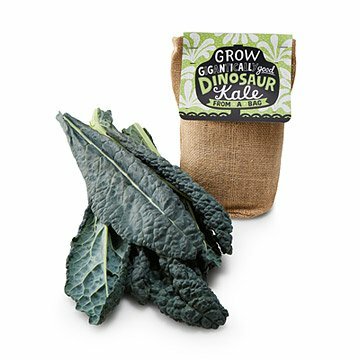 The seeds are "dinosaur kale," a cold, hardy variety that thrives when planted in cool weather and will continue producing all the way up until the ground freezes. Its vitamin-rich leaves are great in salads, stir-fries, and casseroles. Jute bag from India; kit assembled in New Jersey. It is intriguing to have this neat little self contained package that will potentially turn into many meals to come. My kale-loving best friend and her boyfriend moved out to California where they can't currently grow their own garden. She was complaining about how much she missed her family's kale crop back home, and this was the perfect solution! I bought it as a Galentine's Day gift, and she loved it! My mother has always had a green thumb and recently started to really watch her health and diet. She loves kale so this made a pretty good gift. She couldn't wait to start growing it! It's growing right now in the kitchen window!